CAS Building and Remodeling has over 25+ years’ experience in the Room Additions and Remodeling business, with hundreds of satisfied and repeat-business clients in the Aledo, Weatherford, Colleyville, Southlake, Trophy Club, Grapevine and Fort Worth areas. As one of Fort Worth’s most respected and trustworthy Building and Remodeling Contractors, CAS will offer you the chance to design, build or remodel room additions to your existing property which will help you to realize your unique vision..
Perhaps you need to plan for a detached garage addition to allow space for an extra vehicle? Maybe you are thinking of a second storey addition for that extra bedroom or bathroom you always wanted upstairs – or a remodeling of existing rooms to accommodate more varied leisure activities? Our award-winning design team has all the most popular current designs in remodeling room additions at their fingertips. We will be happy to take all your own design suggestions into account, together with our own ideas and experience, in order to make sure that the room additions and remodeling you have in mind will fulfill all your expectations. We will advise you how to make the best use of your existing space, how to utilize available facilities, and where to install new ones, including all necessary electrical and plumbing features. At CAS Building and Remodeling, we have the construction expertise to design and build both room additions and detached garage additions, to remodel all types of room spaces and to ensure that all safety features are within specification for the protection of your family. CAS has you covered If you are in need of a living space with ADA features for aging relatives or friends. Our team of experts can help you design or remodel the perfect space for your relatives or family friends that need assistance or can no longer live alone. CAS are also experts in the field of business and leisure remodeling, and we can help you design and build – for example – an office remodel, in order to incorporate all the latest business equipment and electronics; a media room remodel to fit in that super-size flat-screen TV; or a games room remodel, for that pool table you have always wanted. Maybe you're in the market for a basement remodel, having decided to make it over entirely from storage to usable space, perhaps to incorporate new equipment for an exercise studio or laundry room. The ways in which your living space can be repurposed are many and varied, and CAS will be there with you to supervise every phase of the project, from the initial survey, through the planning and construction stages, to the final installation by our skilled craftsmen of custom equipment and fittings. 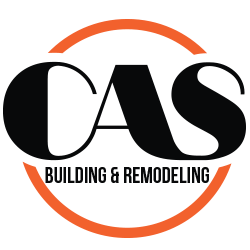 CAS Building and Remodeling is a local business in the Fort Worth area with access to the highest quality products on the market today, but we are also committed to supplying top-of-the-range room additions and remodeling at a fair and honest price. We aim always to keep within reasonable constraints of time and budget, and will keep you fully advised of all progress on your project. As a family-owned and operated business, we pride ourselves on being a turn-key company. From the very first phone call to the fitting of the final junction box, our experienced advisers will be with you, every step of the way.